Not to be confused with Stabs in the Dark. Stab in the Dark is a microgame in WarioWare: Twisted! It returns in WarioWare Gold as one of Ashley and Red's microgames. 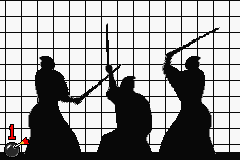 The player controls a lone samurai who must stop samurai assassins from attacking him by touching them with his sword. 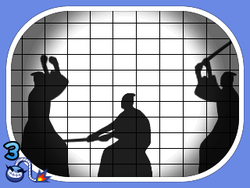 If the player's samurai's sword is correctly tilted, either the other's sword will fly off or, if it's pointing at his chest, the samurai will drop the sword and say "Ouch". 1st level difficulty: There is a single assassin. 2nd level difficulty: There are two assassins. Sometimes, one of them charges at the player's swordsman, but then runs back; then the other assassin charges from behind. 3rd level difficulty: The same as level two, except that sometimes one of them stops just in front of the player's sword; then the other one strikes from behind, and the one who had stopped charges forward again. A souvenir called Stabs in the Dark also appears in Twisted! Its gameplay is identical, but assassins keep coming and attacking until the player gets hit. In WarioWare Gold, to accomplish the mission "Two Hits", the player must clear levels 2 or 3 by only hitting the assassins in the stomach or chest. This page was last edited on March 2, 2019, at 19:11.